Located in the northwestern part of the country, with borders to Wyoming, Idaho, North Dakota, and South Dakota, as well as several Canadian provinces to the north, Montana is the fourth biggest state in terms of size but the eighth least populous, making it one of the most sparsely populated states of America. This state is home to a little over a million people, spread out across a landmass of nearly 150,000 square miles. The relatively low population of Montana is due to its incredible terrain, with huge mountain ranges making up large parts of the state and lots of agricultural land as well. Home to many major natural areas like Glacier National Park, the Beartooth Highway, Flathead Lake, and the iconic Yellowstone National Park, Montana is a highly popular touristic state. Known as 'The Treasure State' and also nicknamed 'Big Sky Country', Montana is beloved by nature lovers and outdoor enthusiasts for its stunning scenery and outdoor recreation opportunities. All kinds of activities can be enjoyed in Montana like hiking, biking, horseback riding, kayaking, rafting, and more, so it's a super spot to do some camping or take an RV road trip. Lots of highly rated RV parks can be found all around Montana to accommodate you and your fellow campers during your stay in the state. 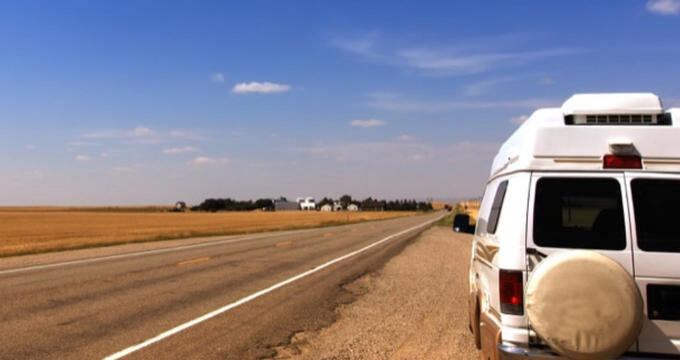 Read on to learn all about Montana's best RV parks, complete with names, addresses, contact information, and brief overviews of each location to help you decide where to stay the next time you're driving through Montana in an RV. Yellowstone National Park is one of Montana's biggest natural attractions, with many millions of people visiting Montana each year purely to roam around this amazing national park. If you want to camp out right in the heart of one of North America's most beautiful locations, the Yellowstone Grizzly RV Park is a great option. Situated in West Yellowstone, this highly rated RV park is just a few blocks from the west entrance of the national park itself. It's also situated in close proximity to some high quality shops, eateries, and attractions too. Yellowstone Grizzly RV Park features tent camping sites and rental cabins to go along with its spacious RV sites. There are lots of exciting hiking, fishing, and biking trails and locations waiting to be found mere minutes from this RV park, and the views at the park are truly beautiful. The RV sites are full hook-ups with all the utilities you need, along with cable TV channels and reliable Wi-Fi service. On-site amenities here include a spacious play area for kids of all ages, a grassy space for picnics and games, a pavilion for gatherings and meals, a main building with a gift shop and convenience store, a business center, a laundry area, clean restrooms and showers, and multiple bathhouses all around the park. Out in the Missoula in the northwestern corner of Montana, Jim & Mary's RV Park is another excellent place to stay in this beautiful state. Having received countless 5-star reviews from past guests and travel experts alike, Jim & Mary's RV Park has a really family friendly vibe, clean facilities, and large RV sites to cater to all sizes of motor home. The park is beautifully landscaped and laid-out with lots of shady spots to cool off, private lawns for each RV owner, and gorgeous flower gardens to admire and enjoy. Rates at this Montana RV park start as low as $50.25 for full hook-up RV sites with water, sewer, electric, cable TV, and Wi-FI internet. You can get a discount on that price if you happen to be a member of the Good Sam Club, and longer stays also come with discounted prices. Jim & Mary's RV Park features some great amenities like high quality restrooms, well-kept showers, and efficient laundry machines to keep all your clothes and linen clean and fresh. Pets are welcome at this park too, as long as owners follow some simple rules like keeping dogs on leashes at all times. Another fun feature of this Montana RV park is that live entertainment is on show in the summer months, with country musicians LeGrande Harvey and Rod Brod on site to entertain all the guests. Warm welcome and friendly surroundings will be waiting to greet you at The Nugget RV Park, located in northwest Montana, not far from the international border with Canada and the state border with Washington. The first thing that stands out about this highly rated RV park is its location. The scenery all around the Nugget RV Park is beyond breathtaking, and you'll definitely want to bring a camera along to capture the local beauty and preserve your magical vacation memories forever. Forests and mountains can be seen all around, and this is a perfect RV park for nature lovers or outdoor enthusiasts looking to do some hiking, biking, wildlife spotting, and similar activities. This Montana RV park is spread out over more than 50 acres of land and features a lot of full hook-up sites with 30/50 amp power. All RV sites here also come with wireless internet access, and the sites are spacious enough to handle big rigs too. On-site amenities at the Nugget RV Park include a huge clubhouse for all sorts of fun and games, a fully heated swimming pool, clean restrooms, high quality showers, a great laundry area, a communal kitchen, a tree hunt for people of all ages to enjoy, and over two and a half miles of scenic walking trails. This RV park is also a hotbed of activities, with lots of fun events organized all through the year, ensuring there's always something to look forward to.